Apple today updated its iOS adoption numbers, as measured by usage of its App Store and presented on the support page for developers. Over the last two weeks, iOS 7 has managed to grab another 2 percentage points from iOS 6, resulting in the former increasing to 78 percent and the latter falling to 18 percent. Apple first reported iOS numbers based on App Store usage on December 1, 2013, when 74 percent of users were on iOS 7, 22 percent were on iOS 6, and 4 percent were on earlier versions. 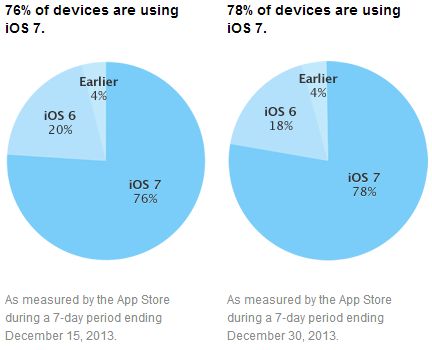 In the month of December at least, iOS 7 is stealing 1 percentage point from iOS 6 every week.